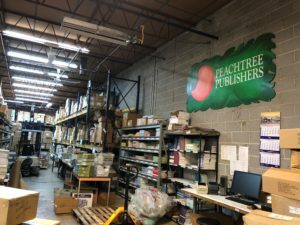 Home Uncategorized Field Trip: Tour Peachtree Publishers! Earlier this month I flew to Atlanta for a book event and had the opportunity to stop by Peachtree Publishers. 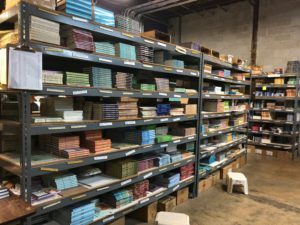 A visit to a publishing house is a rare treat for me, so I thought PBB readers might enjoy a quick behind-the-scenes tour. First I stopped at the office of Margaret Quinlin, President and Publisher of Peachtree, an independent woman-owned business. Margaret has been at the helm of Peachtree since 1990 (28 years!) Near as I can tell, Margaret knows everything about the book business. 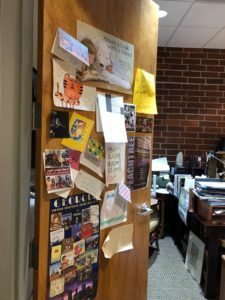 And as you can see by the wonderful hand-written notes on her door, she’s also very connected to readers, authors, and notables in the publishing world. 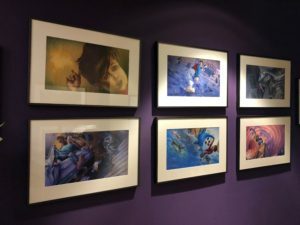 Down the hall, a purple wall filled with striking art by Michael Austin from Late for School (written by Mike Reiss) caught my eye. What an inspiring place to work! Of course, fantastic books were everywhere — in hallways and conference rooms! 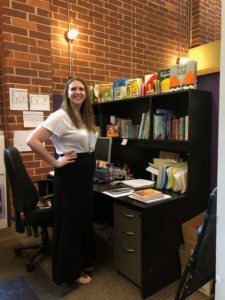 Next stop was the cheery office of Emily Dowdell, Peachtree’s top-notch Publicity and Marketing Associate. We’ve had plenty of bonding time during book events in Chicago, New York, Washington DC, and Georgia. She keeps everyone organized, including me. Next, I came across something very interesting — the dreaded slush pile! Peachtree’s “pile” was surprisingly small. (I’ve always envisioned huge, towering piles of submissions in editors’ offices.) 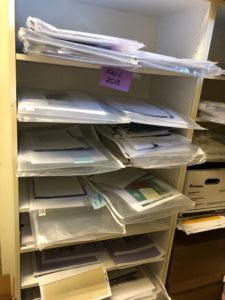 Their awaiting submissions were neatly organized by the date they were received, and would be read in the order they were received, with each one receiving a response in the mail. They receive about 200,000 manuscripts a year and publish 45 annually. Acquired submissions eventually move into Peachtree’s current books-in-progress area (below.) Each large clear envelope is filled with the latest art and story revisions so everyone can access the project quickly. Peachtree’s warehouse and shipping operations are conveniently attached to their office. All their titles are organized on open shelving so it’s easy to grab the books needed to fill each order. 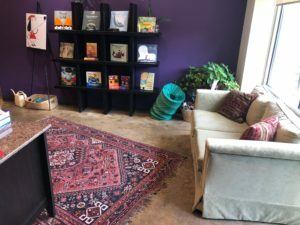 I never thought of a warehouse as a cozy place, but this one was beautiful and inviting with all the colorful, shiny books stacked on shelves. Well, that concludes the tour. Check out the Submission Guidelines on Peachtree’s contact page for more details. 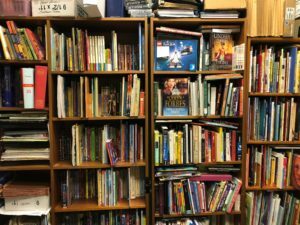 You can check out Peachtree’s books on their blog. 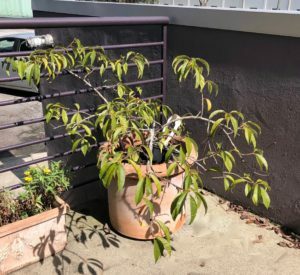 If you’d like to know more about the staff, here are a few interviews from their blog. Kathy Landwehr, Margaret Quinlin, Peachtree, Peachtree Publishers, Publisher tour, Publisher visit. Bookmark. Thank you for this post! The photos are much appreciated and I enjoyed my tour. Glad you enjoyed the tour Danielle. It was so interesting to see office spaces and the incredible warehouse with all their gorgeous books! So fun to learn more about Peachtree from the inside. Love their beautiful, enduring books. Peachtree is lovely inside and out. And yes, their beautiful books do stand the test of time! I’ve always admired Peachtree. This tour was a nice peek behind the curtain. Thanks! Everyone at Peachtree is so smart, professional, and kind. It was exciting for me to take a quick tour of where all the magic happens! Glad you enjoyed taking a peek with me! Hi-Thank you so much for this delightful tour and awesome information about Peachtree Publishers. 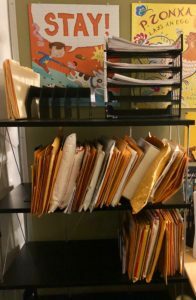 It’s so helpful to see a behind-the-scenes look at children’s book publisher. Thank you again Suzanne!! Thanks for stopping by and taking the tour! It was very interesting to see a bit more about their work process and the many people who work so hard to create wonderful books! This is wonderful, Suzanne! What a great idea to share this behind the scenes peek with everyone. I worked with Peachtree on THE GRUDGE KEEPER, and they were so lovely. Thank you and congrats on your new book! I LOVE The Grudge Keeper! Such a great book, with a great publisher! I loved this behind-the-scenes look! Thanks for taking us along on the tour with you! So glad you enjoyed the post Lauri! 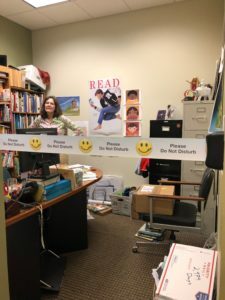 I didn’t have any ideas what to do for this month’s post, then the day I arrived in Atlanta it hit me — a tour of Peachtree post! This was one of my favorite posts in a long time. I feel like I took the tour with you, and it really gave a warm and nice description of a publishing company. Thank you. Thanks for your kind words, Gela! I’m really happy you enjoyed the virtual tour of Peachtree. Thank you for stopping by! Ahhhh. A peek behind the curtain! What a treat! Thank you for sharing this tour with us all! Glad you came along on the tour Beth! It’s more fun to share with others! I’m always so curious about people’s workspaces, so this was really fun. Lovely offices! And how interesting to see an actual “slush pile.” Thanks, Suzanne! I’ve always been curious about editor’s offices, so this visit was fun. So glad you could join me on the virtual tour Linda! 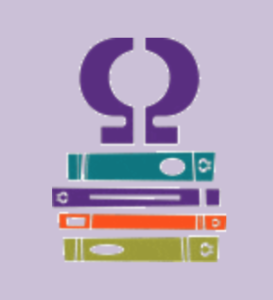 I bet you’ve visited a few publishing houses yourself! That was a fun tour! Loved seeing where your manuscript went to published! Hi Tia! Glad you enjoyed the tour of Countdown’s publishing home. Thanks for visiting Picture Book Builders! Thanks so much for the behind-the-scenes tour! I’m glad you stopped by and enjoyed the tour, Darshana! Wow! I loved this behind-the-scenes tour. One of my favorite posts you’ve done so far! Thanks, Suzanne. I’ll have to try and think up other “tours” I could feature in the future. Oh, how I love a good behind-the-scenes peek. Thanks for giving us the tour! 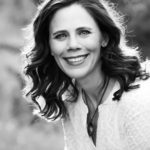 I’m with you Tammi — it’s fun to get a look behind the mysterious world of publishing. Thank you for the tour!! 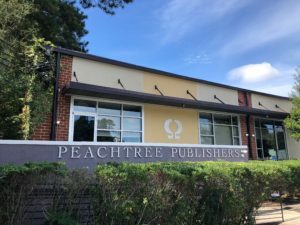 I have always been drawn to Peachtree Publishers as a “good luck” publisher possibility for me because my daughter lives in Atlanta and I am working on PB manuscripts. Somehow seeing actual photos of people and the work settings makes a publishing house feel less intimidating. Congratulations on your book being out there on the display rack-awesome!! How fun you have a daughter living in Atlanta! Congrats on the pb manuscripts you’re working on. It seems like Peachtree may be a great place for your stories! I enjoyed your tour of the tour. I was most surprised by the books-in-progress photo. I think because I’d never thought about how they’d have to keep the different pieces together and accessible. Thanks! I was also surprised to see the books-in-progress area, but then I remembered seeing the same thing when I visited Charlesbridge. (I have the memory of a goldfish!) Thanks for stopping by Mary! This post was so much fun! I sold my second book to Peachtree . . . [no publication date yet]. YEA!! Congrats Kathy! 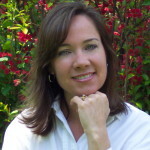 Can’t wait to hear more about your next Peachtree book. If it’s a picture book, let me know when it gets close to release and we’ll do a post about it. Thank you so much for the Peachtree tour! Very interesting to get an inside peek at this wonderful publishing company. And it was a special treat to see my book ZEBRA ON THE GO displayed on Emily Dowdell’s desk! Congratulations on COUNTDOWN. I’m looking forward to reading it. Zebra on the Go is an awesome book! And it does look great on Emily’s shelf. Thanks for stopping by! Very fun to see the inside of this publisher! Thanks for sharing! Late to the party but how FUN!!! Thank you for sharing your pictures. It must be so wonderful surrounded by stories in all stages of development!! !